If there's one type of sock you can't do without it's the Bonds Oxford Crew. 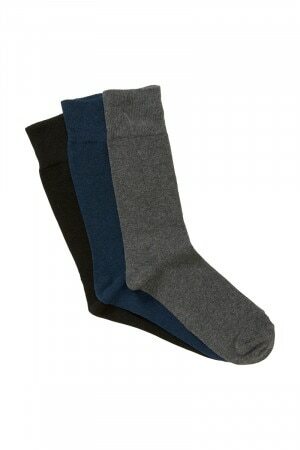 These socks are made with soft cotton and they're great for everyday use. Great all purpose socks! Mens Everyday Crew Socks 3 Pack is rated 4.3 out of 5 by 21. Rated 4 out of 5 by OCD Tim from Great sock, but beware the flair I bought 4 of these, so 12 pairs of socks for my everyday wear. I expected 24 black socks that could be paired with each other without a care in the world. Alas, I was wrong. Each pair in the 3-pack has a different coloured stripe across the toes. This bit of flair does not sit well with me. I am not going to be able to take these socks out of the washing basket without pairing the same colours together. This will not only take time, but there is the risk that if 2 socks go missing, that could result in me being down two pairs of socks, rather than one plain black pair. You might say that no-one will know when I am wearing them. To that I say: I will know. Rated 1 out of 5 by Amin from Ive bought many socks from Bonds online, however I am not happy with these socks. The top is too tight, leaving marks. The colours are annoying cause they need to be matched. What I'm looking for is a thin business sock, seamless toe, loose top, and no annoying colours that need to be matched. Rated 4 out of 5 by fionaolsson from Good quality, very happy with them, but the model in the picture must be 8ft tall, because these socks pull up to the knees of a 6ft tall man! Rated 2 out of 5 by Matteo from Nice socks, although a bit long. These socks were great quality, however, for me, they were a little bit longer than I would have liked. I returned them, free of charge and of course Bonds refunded my money. Rated 4 out of 5 by Mike777 from Good socks These socks are fine, they're high quality and comfortable. The only bad point I've experienced is that the Bonds logo, which was printed on the soles, came off after one or two wears. Didn't affect the function of the item, but it's not a good look. One other thing: I prefer the 'very comfy crew's socks, but they don't come in many colours. It would be great if they did. Rated 5 out of 5 by KaraM from Great Socks! I bought 3 packets of these socks and they are great - super soft and the colours are really nice too. The "Bonds" lettering that was adhered to the each sock fell off each sock in short order and we are still finding the letters all over the house - I suspect this will in no way affect the performance or longevity of socks! Great product. Rated 3 out of 5 by tripleb from Black socks uncomfortable up the front :( I like them but they aren’t comfortable up the front of the sock cause there’s a line of material. I didn’t see this in the photos and I’d really like the same sock without the material sticking out.